The various “Manga Guide to…” books published by No Starch Press have reviewed by me and I’ve found them all to be an interesting an novel way of using manga to give basic knowledge about subjects that might be considered tough and intimidating. So, when the folks from No Starch Press asked me to review their latest offering in the series, I was happy to do so. As is customary, a very light story framework is established to provide the vehicle to teach about relativity. Here, the story has the nutty headmaster of the Takai Academy demand the junior class take a summer course on relativity. Class representative, Minagi, decides to take one for the class to allow them to enjoy summer. As such, he is sent to learn from Uraga, who’s very passionate about relativity. The school’s superintendent takes on various disguises, including as the dog vice principle of the school, to investigate things that were going on. The book has four chapters with a manga section giving the basics and then a more traditional textbook style section at the end of the chapter to further expound upon the topics discussed in the manga. The first chapter covers the basics of what relativity is and the history that lead to Einstein’s famous equation E=mc2. It focuses on the simplified “special relativity.” The second chapter discusses time slowing down and the Urashima Effect. The third chapter covers how objects that approach the speed of light become heavier and smaller. The fourth chapter covers the more complex “general relativity,” which incorporates the effects of acceleration and gravity on relativity. 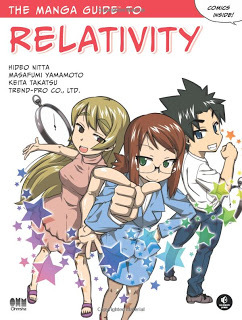 I found the book to be interesting and provide a nice, basic level of understanding of relativity. I was amused that the book’s creative team felt a need to get some fanservice in by having Uraga in a swimsuit for chapter three. To me, if one is trying to provide some level of teaching of relativity, the fanservice would be more of a distraction. I’m guessing that the team thought that this would keep readers engaged and considering the popularity of the series, I guess they were right. Still, I think that while this book certainly won’t qualify you to teach the subject of relativity, those who are interesting in learning and want a foundation from which to launch further studies will be well served by this book. It was generally observed that the human brain works best at images, instead of pure numbers and words. The utilisation of the art of manga enables people to better remember the abstract formulas and concepts that are often hard to be imagined by an average person. I used OpenDNS Guide to search your site and I found the link to your review of the stats book along with the link to your main page. That was pretty amusing considering that both topics have a fair bit in common.